While most custom woodworking projects are one-of-a-kind, some really stand out from the pack with a high level of uniqueness. Recently, a pantry manufactured by Schrocks of Walnut Creek in Walnut Creek, OH, for a high-end residence in the Atlanta area turned out to be such a job. The house is extremely large, and the owners do a lot of entertaining. So they wanted maximum storage with no wasted space. They also requested a design that put as much storage vertically as possible, and they wanted all storage to be easily accessible. The cabinets had to have a traditional look in order to integrate well with the rest of the area. â¢ Motorized drop-down cabinets, such as the kind used over counters, were considered. But they encroach on the space below, so there seemed to be no benefit. Typically, this type of cabinet is used only in kitchens and not in pantries. Also, there was not sufficient room depth to enable operation of drop-down cabinets. â¢ A special ladder was considered. But there was not enough room, and it was considered to be dangerous and not very user-friendly. â¢ A dumbwaiter-type of system also was considered. But they felt there was no easy way to modify it to maximize space. Ultimately, the company chose a custom vertical carousel from StorageMotion Inc. (storagemotion.com). Its AutoPantry brings all items down to the level needed and also brings items from the back of the cabinet to the front for easy access. It was used inside the pantry, which is sort of triangular-shaped, 12 feet high and 35 square feet. shelf system that maximizes storage in a relatively small space. Besides being small and requiring access to significant upper-level storage, the pantry would have had little standing room if standard cabinet doors were used. As a solution, StorageMotion included an automatic panel lift in the carousel. 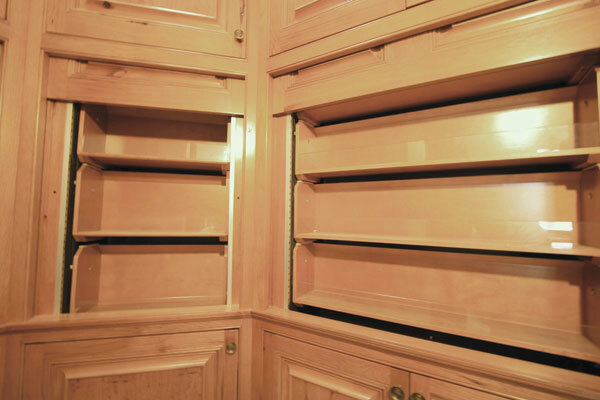 The doors go up and down vertically and disappear behind the upper cabinet door when they are opened. Another challenge was finding a good place to put the controls, because of limited space. The company selected a remote control, which gives the ability to open and close all the automatic doors at the same time or individually, as well as the ability to run one carousel at a time or all carousels at once. The remote control is driven by radio frequency, so it does not have to be pointed at a certain sensor to operate. Each carousel has a home position, so that location of items can be easily determined. Schrocks of Walnut Creek had strict requirements for the depth of each carousel so that wall space would be maximized. Because of the shape of the pantry, the greater the depth of the storage and carousel, the less wall space or carousel width would allow. Specifically, the two carousels on the ends had to be no more than 16.5 inches deep. Because the shelves in the carousel have to be able to make the turn from front to back and back to front, there also had to be adequate depth allowed. Everything was done to conserve space with respect to depth. Because Schrocks of Walnut Creek wanted shelves to disappear into the cabinets below, so when the carousel shelves make the turn from front to back, it is not visible, there was a pinch-point created that had to be addressed. The shelves are not rigid in their track and have some give to them, but more protection was desired. to prevent the door from closing on a finger. Because the pantry would be used to store heavy or bulk items, it was decided to make the carousels start at about 3-1/2 feet off the floor and go all the way to the top of the ceiling. Regular stationary storage in regular cabinets was used for storage near the floor. This way, heavy items can be stored below the carousel, and items that are smaller and have more need for selection assistance go onto the carousel shelves. With all the considerations and decisions that were made with regard to the cabinet interiors, Schrocks of Walnut Creek also achieved a beautiful-looking kitchen and pantry. The cabinets are brown character hickory, with the same material used for the carousel shelves. The company used a combination dye stain/wiping stain, and the finish is catalyzed conversion varnish.